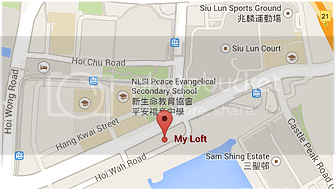 What's happening around the Sam Shing - Gold Coast - Sham Tseng area in September? After taking a summer break in August, we have plenty of news from around the area. Falling on the 15th day of the 8th month according to the Chinese lunar calendar, the Mid-Autumn Festival is the second grandest festival after the Spring Festival in China. It takes its name from the fact that it is always celebrated in the middle of the autumn season. The day is also known as the Moon Festival, as at that time of the year the moon is at its roundest and brightest. Read what Feng Shui Master Jill Lander of Golden Elements has to say about the festival on our front page. Goldcoastonline.hk has previously mentioned that local boys Rory and Toby Meek had both qualified for the World BMX championships in the Netherlands. 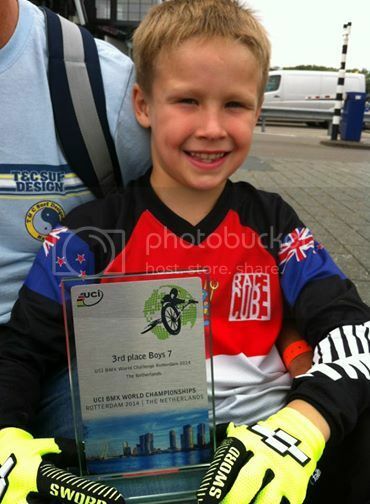 We are pleased to say that Rory (7) is the World Number 3 BMX rider for his age, and Toby World Number 8! Read more about Rory and Toby our front page. Find out why MedStars has now lost $2,000 per month revenue because of $24 and exceptionally poor customer service. The full story is on our front page. Local Beaches - Closed, Re-opened and Crocodiles! 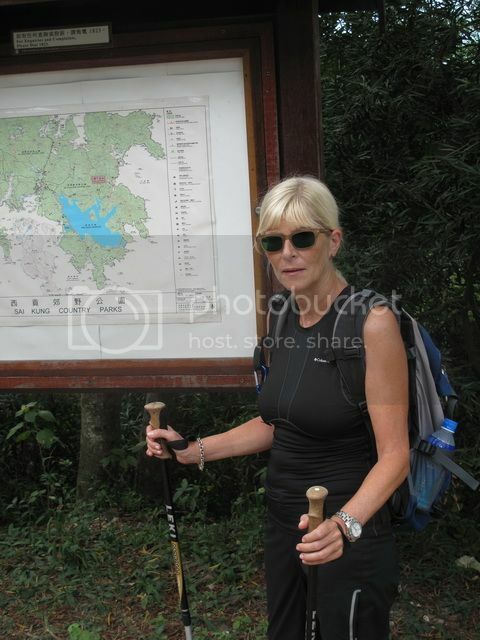 August saw all beaches from Tuen Mun to Tsuen Wan closed and then re-opened because of a sewage leak. Perhaps it was no bad thing as a crocodile was allegedly sited on a beach in Siu Lam, just 1 kilometre from the Gold Coast! Many parents and children will remember Nick Miller, who was the Principal of the YHKCC. 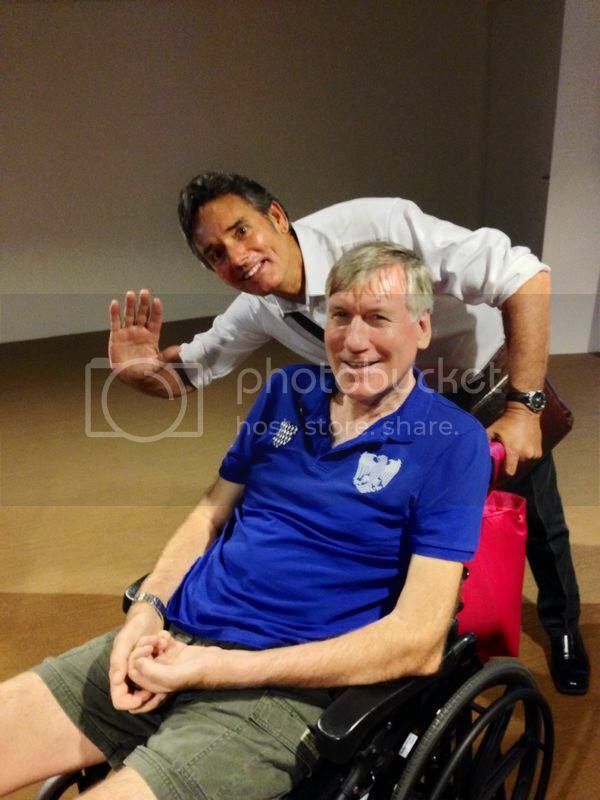 Nick and his wife Alison moved to Singapore where, sadly, Nick has been diagnosed with ALS - Amyotrophic lateral sclerosis (ALS), often referred to as "Lou Gehrig's Disease. ALS is very much in the news at present because of the Ice Bucket Challenge which aims to raise funds for research in to a cure. Marina Medical Practice will open on the 1st floor of the Gold Coast Piazza in October. Due to an engine immobiliser problem my car had to be towed to the garage, and then from there to the Mazda service centre in Tokwawan. I had had Mr. Lee of Kwong Chak Towing Co. recommended to me, and I am more than happy to give him a good service mention for towing my car on both occasions. Mr. Lee speaks excellent English, and is prompt and efficient. Local residents Jenny England-Brammer and Sonia Sharma would like to invite you to a Macmillan 'World's biggest Coffee Morning' on Friday 26th September, so please save the date! This will be an invaluable chance for us to raise money for Cancer Research and in the words of the recent cancer advert "We are coming to get you!" See full details on our front page. 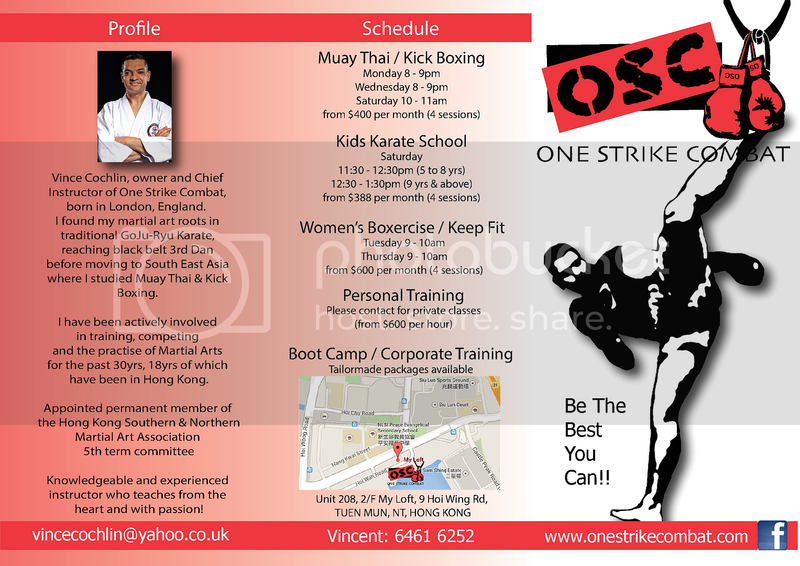 Goldcoastonline.hk is very pleased to welcome OneStrike Combat as a new advertiser. Muay Thai/Kick Boxing - Regular daily classes which involves, cardio workouts, strength & conditioning based on the art of Muay Thai Boxing. Personal Training - With our One Strike Combat ‘one on one’ sessions, you will achieve your personal goals and objectives much sooner than regular / group classes. All private sessions are customised to suit you. OneStrike Combat is run by owner and Chief Instructor Vince Cochlin, who lives in the Gold Coast area but was born in London. 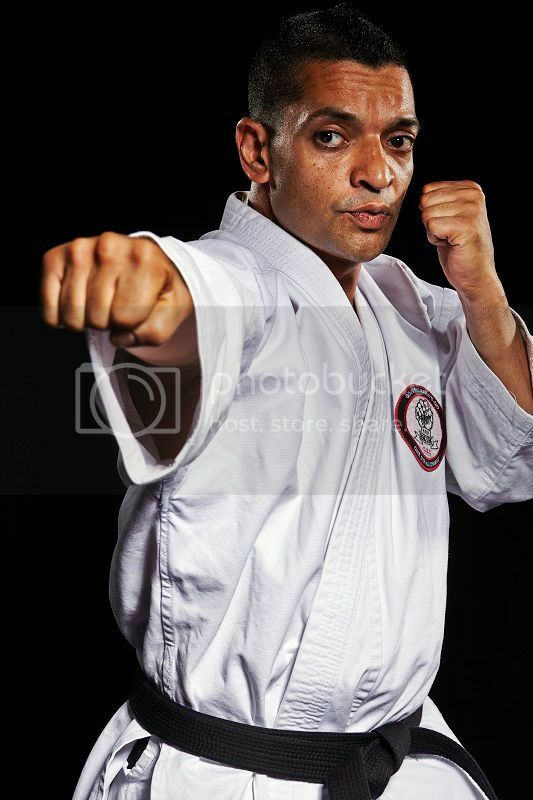 He found his martial art roots in traditional GoJu-Ryu Karate, reaching black belt 3rd Dan in the UK before moving to South East Asia where he studied Muay Thai & Kick Boxing. 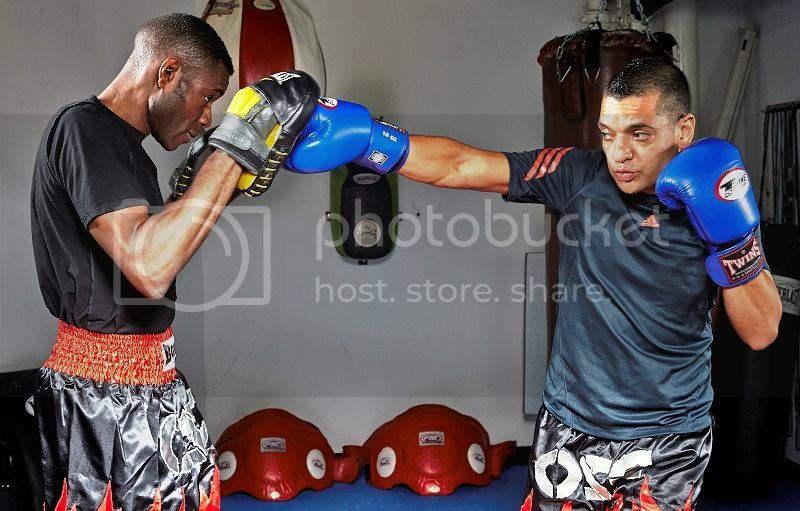 Vince has been actively involved in training, competing and the practise of Martial Arts for the past 30 years, the last 18 years of which have been in Hong Kong. His skill and experience meant was honoured to be appointed permanent member of the Hong Kong Southern & Northern Martial Art Association 5th term committee. A knowledgeable and experienced instructor, Vince teaches from the heart and with passion! Ladies Boxercise / Keep Fit - FREE TRIAL LESSON !!! OneStrike Combat (above) is offering FREE trial lessons in Ladies' Boxercise / Keep fit. Starting at 9.00 a.m. - 10.00 a.m. on Tuesday 16th & Thursday 18th September enrol now While Spaces Last !! New adverts include a 2013 Sealine S42S Junk; 2008 Sunseeker Predator 62 Cruiser; Gold Coast Phase 2 apartment for rent; Ikea Sofa-bed; Seaway 451 Power Catamaran; 2001 Bertram 60 Sportfisher; Tag 60 Sailing Yacht; Sailing Yacht 'Jo Cool'; IKEA Karlstad Chaise Longue sofa; Sofa and Arm Chair; OTO Cyber Wave CW2800 Massage Chair; IKEA toddlers bed and mattress; IKEA kitchen trolley / island and much more! Angelato, the upmarket ice cream shop (gelato is Italian for ice-cream) opened on Saturday 24th August with a free ice-cream give-away, which proved very popular!